Overall, 2016 was very warm (only 0.1° short of the all-time warmest, in fact) and alternated between abnormally wet (especially in the spring) and drought (in the fall). 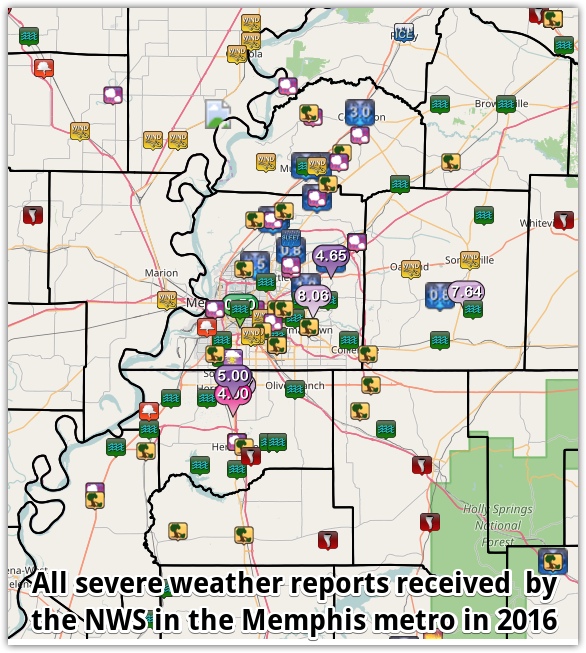 The year started off with a roller coaster January featuring both severe weather and the only winter weather event of 2016. 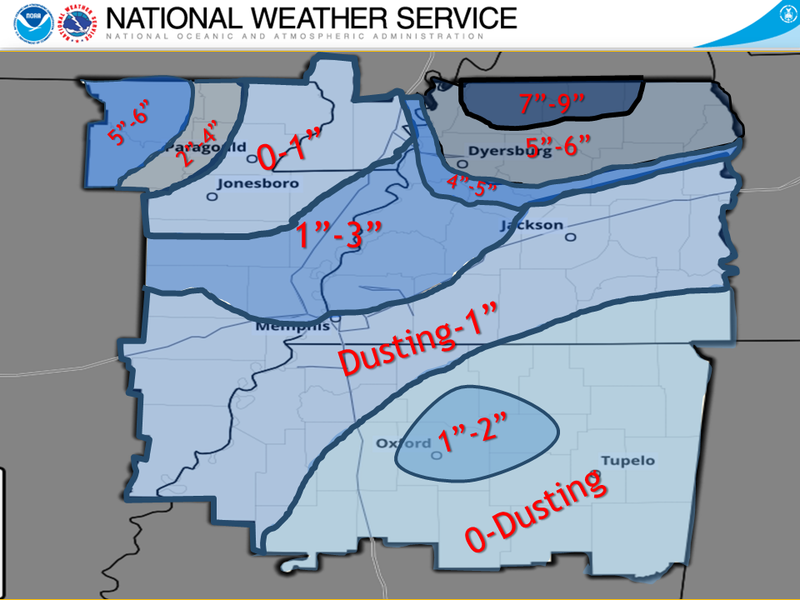 A mix of snow and ice occurred on the 22nd with the official report being 0.3" of snow, though up to 3" fell in Tipton County. After temperatures were near average in January, the warmth of 2016 started in February with temperatures and precipitation both above normal. The month of March was particularly eventful with multiple heavy rain events leading to flash flooding, as well as a Tornado Warning on the 13th. Temperatures were also well above normal. April continued the trend of above normal temperatures. 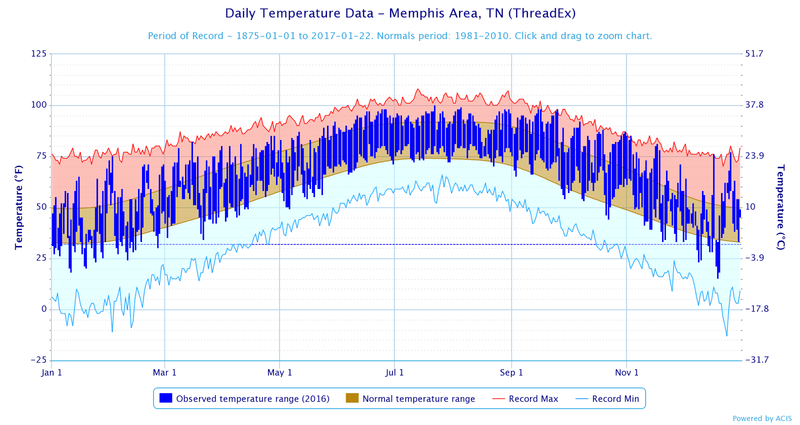 During the month of May, which typically commences summertime warmth, unusually cool temperatures were experienced mid-month with highs in the 60s and only a couple days above 90°. 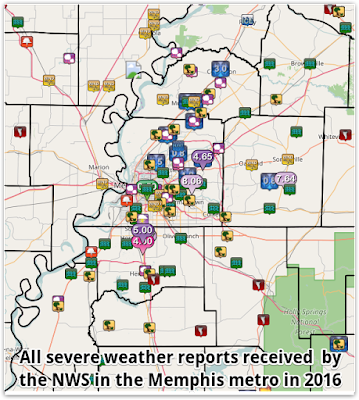 Only a few spotty severe weather events occurred during the prime severe weather season of April and May. June began a period of very warm weather and dry conditions that would continue through the summer and into the fall. The month featured 22 days above 90° and was the seventh warmest June on record. Drought conditions began to show up in north MS. July and August continued the hot trend with both months ranking in the top 10 warmest on record and the three-month summer term ending as fourth warmest on record. In fact, persistent heat is best reflected by the fact that a new record was set for consecutive days with low temperatures at or above 70° (83 days ending September 1). Precipitation was fairly abundant locally during July and August though drought conditions continued in north MS.
September continued to be very warm with 20 of the first 25 days of the month above 90° and the month ending as second warmest on record. That was followed by the warmest October on record. Both months were also very dry with drought conditions in north MS spreading north into the metro and most precipitation falling on just a few days. Fall ended with November ending as the eighth warmest on record and the September-November period being the warmest fall on record, as well as the sixth driest. 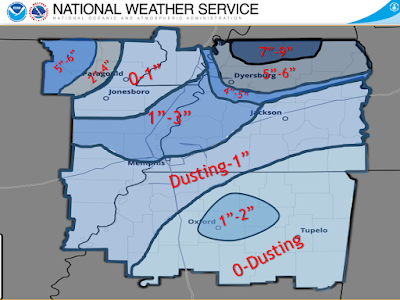 Precipitation in November was sparse, resulting in severe drought conditions across the metro. Winter began with a wide variety of weather in December - warm spells separated by Arctic blasts and stormy periods that included some severe weather reports in the middle (wind damage, funnel clouds) and end (hail) of the month. Records set or tied: Sixteen warm weather and zero cold weather records were set or tied during 2016. 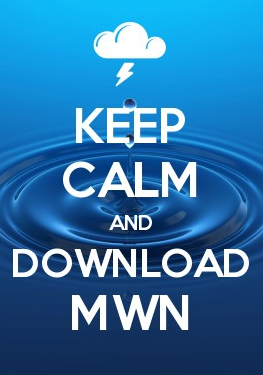 The daily records included: January 31 (61°, tied warmest low), February 2 (75°, record high), March 15 (82°, tied record high), June 17 (81°, record warmest low), June 25 (80°, tied warmest low), July 26 (80°, tied warmest low), August 2 (81°, tied warmest low), August 10 (81°, tied warmest low), August 30 (79°, tied warmest low), September 15 (98°, tied record high, and 78°, record warmest low), September 24 (97°, record high), September 25 (98°, record high), October 29 (85°, tied record high), October 31 (87°, tied record high), and December 17 (76°, tied record high). Comments: 2016 was the 2nd warmest year on record with a 65.8° average annual temperature, finishing 0.1° short of the record set in 2012. June-August (meteorological summer) was the 4th warmest on record (84.3°) and September-November (meteorological fall) was the warmest on record (69.5°). 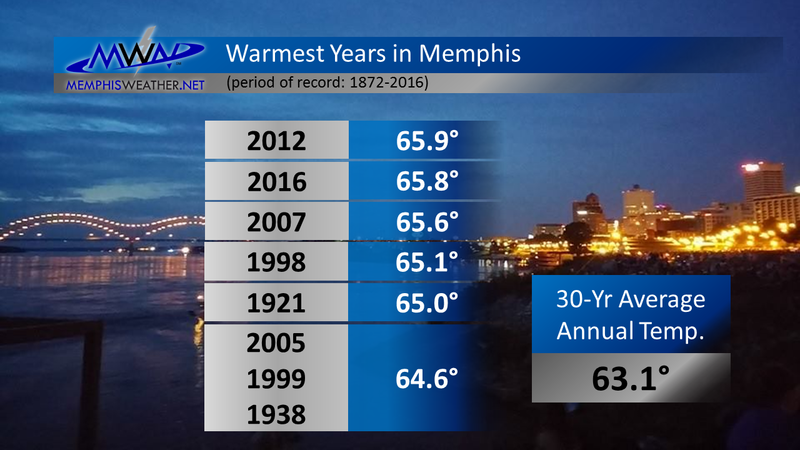 In addition, June (83.2°) was 7th warmest, July (85.0°) was tied for 8th warmest, August (84.6°) was 10th warmest, September (80.5°) was 4th warmest, October (70.7°) was 1st warmest, and November (57.4°) was 8th warmest on record. 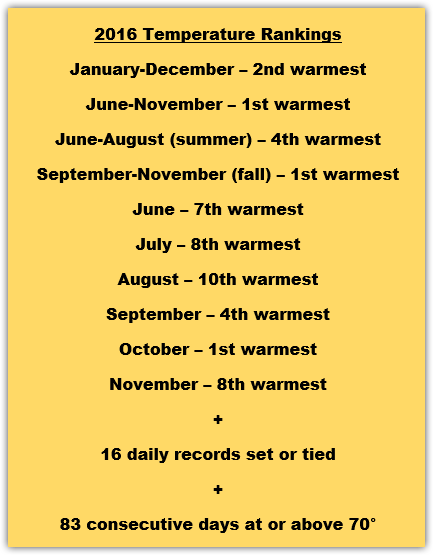 The six-month stretch of top 10 warmest months is remarkable and resulted in the June-November period (76.9°) being the warmest such stretch on record. 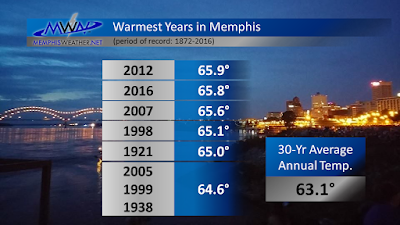 Records set or tied: Three daily records were set in 2016: March 9 (4.53"), March 10 (3.43"), March 31 (2.42", tied). Comments: 2016 was the 18th wettest year in 146 years of record-keeping, boosted by the 4th wettest meteorological spring (March-May, 27.24"). Countering that, meteorological fall (September-November, 4.45") was the 6th driest on record. March (16.20") was the 4th wettest on record, aided by three daily records during the month, and July (8.02") the 8th wettest. 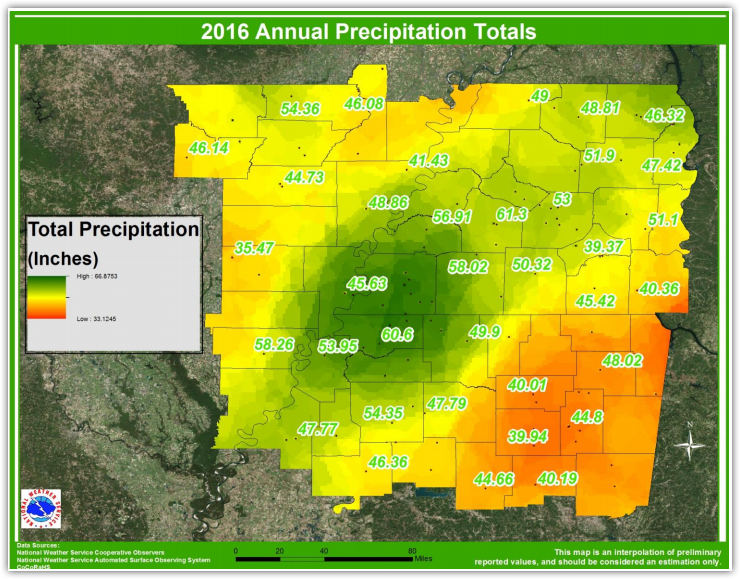 Precipitation accumulation for 2016 is plotted as the dark green line, compared with a normal year in brown. Precipitation was near normal until a very wet early March. 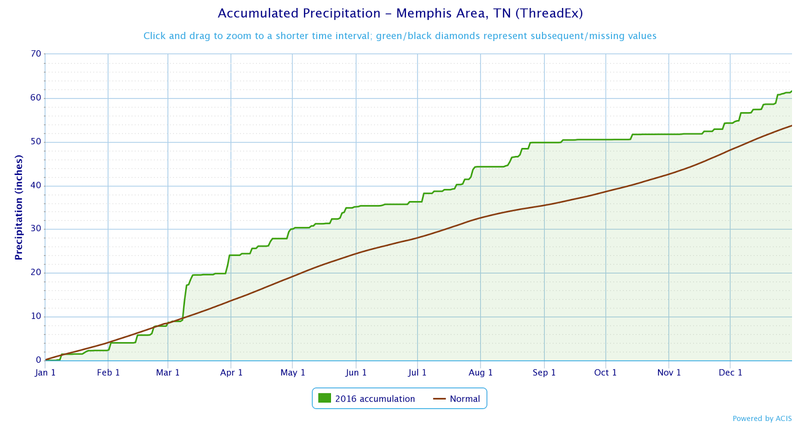 After that point, it remained near average with slight variations, through August before a lengthy dry spell that resulted in drought conditions heading into early winter. Much of the positive departure from normal resulted from deluges in early spring.